David Beckham in collaboration with Coty presents a new fragrance that was created with an aim to reveal the essence of charismatic man with style, football star, trendsetter, husband and father. ''I wanted to create a modern, masculine fragrance that reflects my style'' â€“ says Beckham. David Beckham Homme was announced as woody-spicy and its composition might be very interesting to fans of this group of fragrances. The fragrance arrives in a glass flacon with David's name spreading over glass surface, which makes this edition characteristic and memorable. Elegant white cardboard box features grey letters suggesting strength and elegance of this edition. The front part features a circle marked with the new logo David Beckham Homme. Top notes of this excellent composition offer citrusy zest skillfully mixed with ginger and Szechuan pepper. A heart introduces cashmere, leather and rosemary, while a base leaves a trail of mahogany, patchouli and musk. The perfume was created by Pierre Negrin of Firmenich. 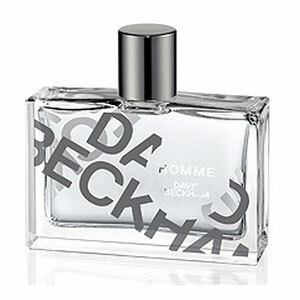 David Beckham Homme hits the shelves in September 2011, as 30 and 50 ml EDT, along with accompanying body care products.